This is a 100 m silhouette range designed for 22 LR rifles with berms at 40, 60, 80 and 100 meters. 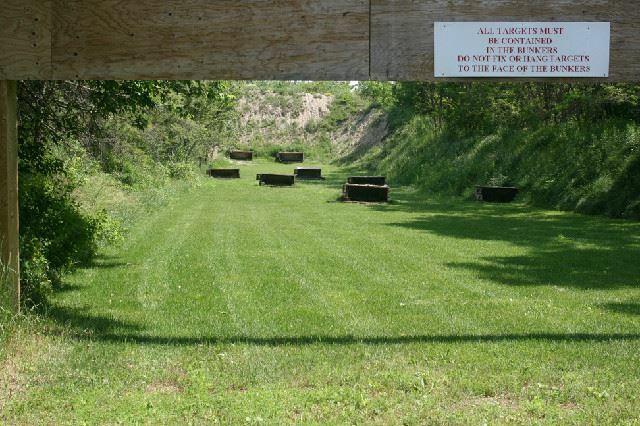 Members shooting handguns on this range must have passed the SGC HANDGUN SAFETY COURSE. Handguns must be shot from a standing position only and must be in line with the target bunker being shot at. No cross shooting at bunkers is permitted. Only at the Shooting Benches. FIREARMS MUST FACE DOWN RANGE and be in a safe condition with actions open, magazines (and all ammunition) removed. Must be within the confines of the existing bunkers. Targets may not be fixed to any place outside the bunkers. Must be commercially available 22LR rated reactive targets that fit within the provided shrouding. Members may use silhouettes or put targets in bullet traps. Do not staple paper targets to the framing timbers in the bullet traps. TARGETS MUST BE CONTAINED WITHIN THE BULLET TRAP. No cross firing at the bunkers. You must be in line with the bunkers at which you are shooting.